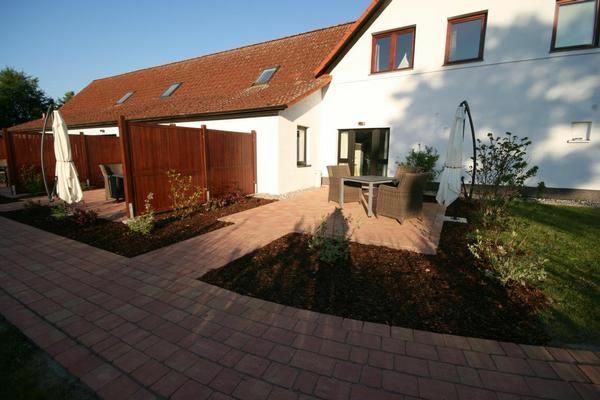 The house is located in Lütow, on the idyllic peninsula Gnitz, directly on the backwaters. On this peninsula, which is located on the island of Usedom, you can find a natural state animal-u. Plant paradise with beautiful hiking trails, beach and fishing in the area is also possible. In the northwestern part of the island of Usedom is the Zinnowitz, the largest and longest established seaside resort, which is just 6 km from Lutow. The island is known for its charming contrasts, forest and lake. The varied picture of the landscape, with beech, oak and pine forest along the coast and the moors and the meadows on the backwaters page enter the island charisma. A small natural swimming area is about 800 meters away. The apartment is brand new and has developed a kitchen, a bedroom and a bathroom on the ground floor with a living space of about 40 square meters. Offers a combined living and kitchen area with a comfortable couch corner. The kitchen is new with dishwasher, coffee maker, refrigerator, toaster oven u. V. M. equipped. There is one bedroom with a box spring. The bathroom has a shower and also natural light. The terrace with garden furniture invites you to have breakfast there or to let the evening fade away with a glass of wine. Did you ever feel like swimming in the indoor pool or sauna? So you only need to walk for 5 minutes. A dog can be brought on request. Linen (once per person, available 8. 5 EUR). Towels (one per person, available 4 EUR). Pet (once per object, costs EUR 20). Internet (per object and day, included in the price 0 EUR). Parking (per object and day, included in the price 0 EUR).